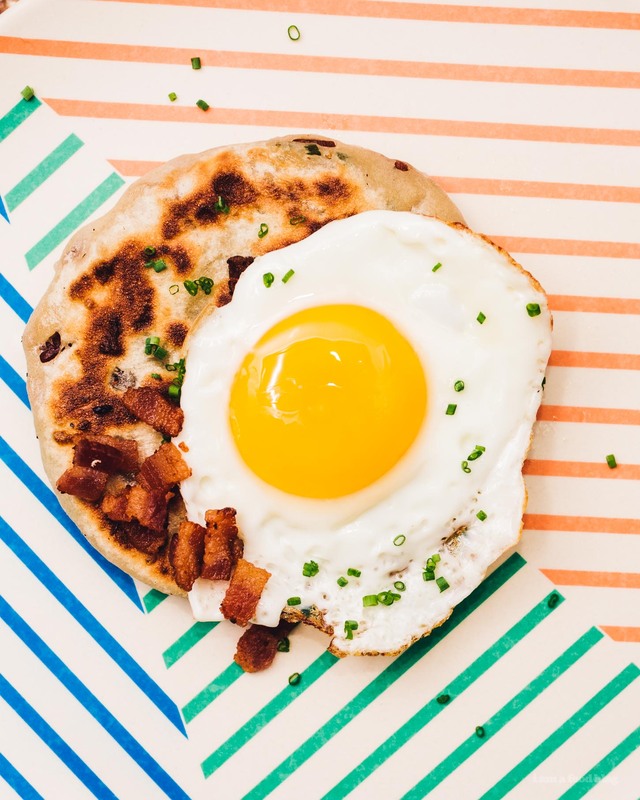 Bing bread like you've never seen it before: your favorite Chinese scallion pancake stuffed with bacon, served up with eggs! Bing bread is the new bao. Even David Chang, who got famous on the back of bao, has no choice but to agree. Just take a look at the menu at his latest LA restaurant, Majordomo – there’s nary a bao to be found. Baos are old news, bring in the bing! I will forever and ever love the fluffy softness of bao, but I’m never one to turn down a fluffy, crispy, bing bread. 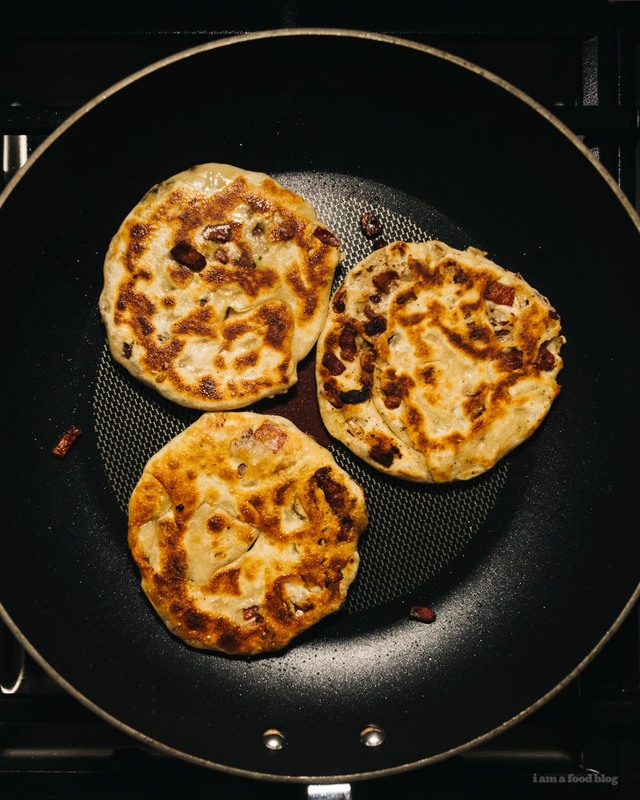 I love scallion pancakes, or cong you bing, or whatever you might call them. What’s not to love about multiple layers of crispy, flaky dough. Especially when it’s stuffed with bacon. Yes, bacon. Mike and I had a random package of bacon in the fridge and we were chatting about what to make with it and Mike came up with bing bread. I was instantly enamored, threw some dough together and here we are. 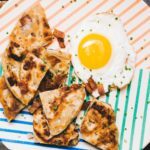 This is a really easy recipe to make and if you’re thinking of having a lazy Sunday brunch, just make them the day before, freeze them (with parchment in between), then fry them up when you want to eat them. If you haven’t had Chinese bing before, they’re essentially a flaky, multilayered, laminated pancake. Just like a laminated dough, fat is put in between layers to help puff up the space between. Bing are made with hot water dough, which helps with flakiness. It also happens to be easier to roll out because hot water doughs don’t have as much gluten– the hot water denatures the proteins so the dough making the dough less stretchy so you can roll it out thinner. Thin equals lots and lots of layers, which is a good thing. 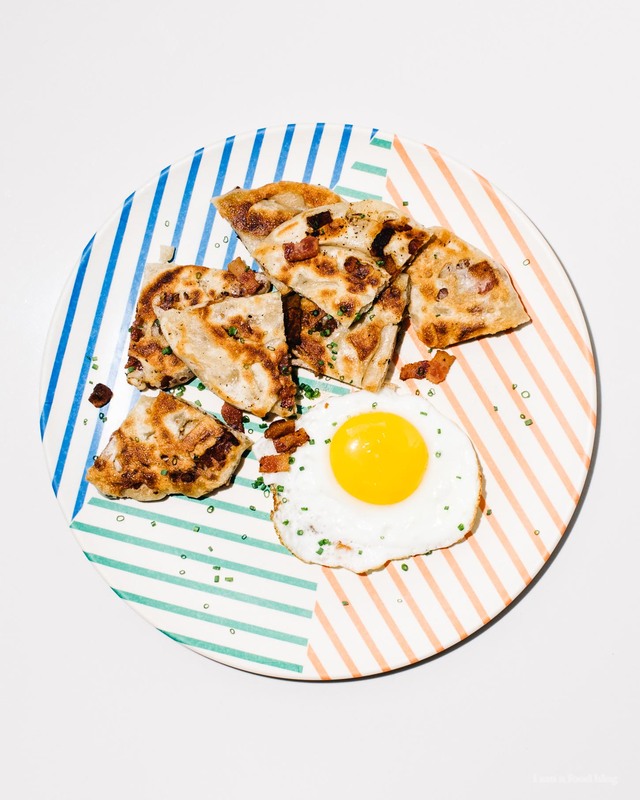 Basically, all you really need to know about this is: bacon + crispy layers + eggs + ketchup = deliciousness. Done. Hope you guys have an awesome weekend! Fry the bacon until crispy. Remove and drain on paper towels. Save the bacon fat. Whisk together the flour and salt. Stir in the hot water, using a wooden spoon and then, when the dough is cool, enough to handle, add the cold water and knead until smooth. Transfer to a clean bowl, cover and let rest for 1 hour. Divide the dough into 4 equal portions. Keep the other portions of dough covered while you use a rolling pin to roll out the dough, as thin as possible. 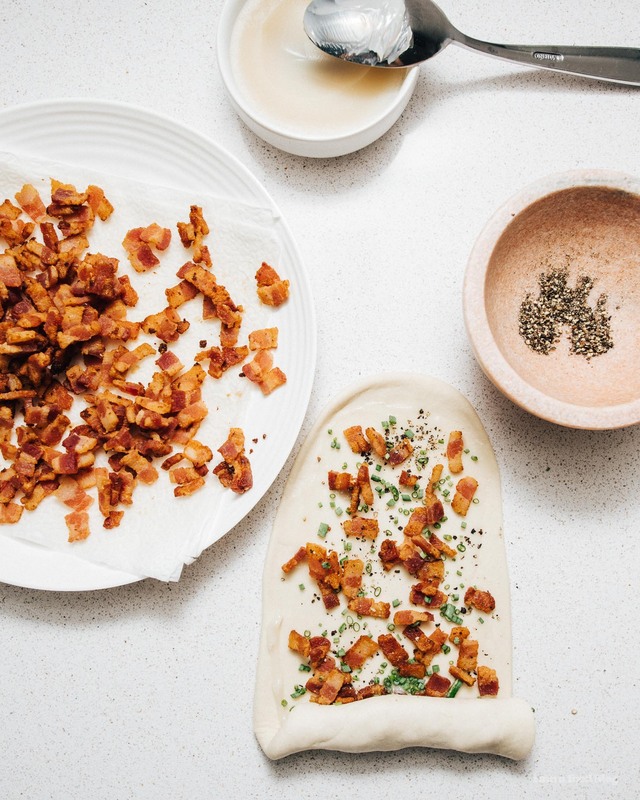 Brush or use an offset spatula to spread on an even layer of of bacon fat, leaving an inch boarder at the “top” of your piece of dough. This is to help you seal the pancake together; if you brush the fat all the way to the edges, it will be harder to seal. Evenly sprinkle on bacon, chives, and pepper then roll up the dough like you would if you were making cinnamon buns, kind of like a jelly roll/tube. Then, form a coil and pinch the end so it sticks to itself and the pancake is round. Flatten the coil with the palm of your hand and proceed to use your rolling pin to roll the coil into a flat pancake. Don’t worry about any pieces of bacon that start popping out. Roll it out so the pancake is about 4-6 inches. Repeat with the remaining dough. To fry, heat up a bit of oil in a large frying pan over medium to medium-high heat. When hot and shimmery, swirl the oil around and then add the pancake and cook until the bottom of the pancake turns golden brown and crispy and the top starts puffing up gently. Flip and cook the other side until brown and crispy and the pancake is cooked all the way through. Serve with sour cream, fried eggs, and ketchup! 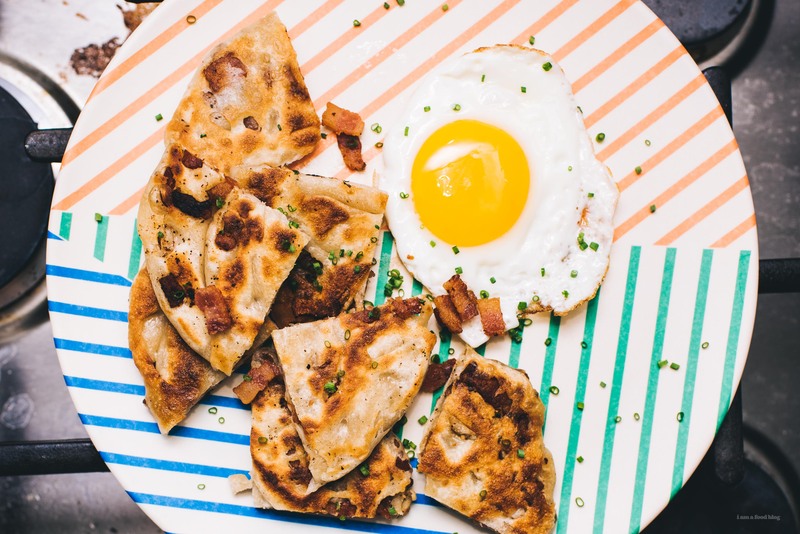 I love green onion pancakes and my love for bacon is match made in heaven. I must try these on my next day off! What a fantastic idea!!! Delicious. I’ll try this method filling with feta cheese.